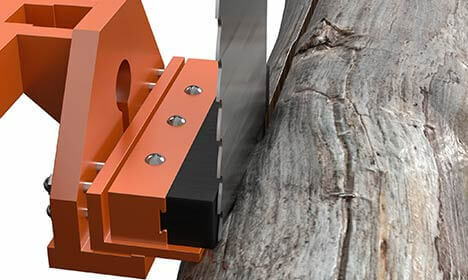 FEROFORM T11 and FEROFORM PR18 bearings operate in the rough and dirty conditions of timber felling to give operational improvements in forestry equipment on gripping arms, suspension joints, and articulation arms. 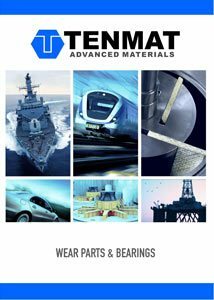 TENMAT RAILKO RG2S is used as guiding elements and pressure guides for any type of bandsaw and resaw in the forestry industry. The friction-reducing additives significantly decrease wear of blade and pads while being capable of running dry for longer periods, making it the preferred choice of material in sawmills worldwide. RAILKO RG2S offers over double the wear resistance to cotton phenolic and carbon fibre wear components. RAILKO RG2S reduces the risk of the guides catching the band saw blade and tearing/damaging teeth. The fibre reinforce material will not chip or crack during use.